If Day Lilies could speak, what stories they could tell. Maybe this is why their blooms last for just a day, secrets must be kept - so sad. 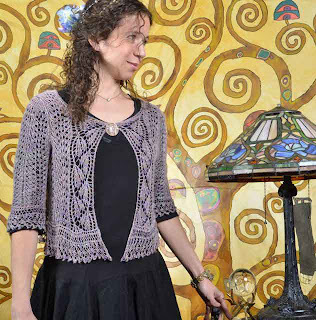 I have two beautiful patterns from two very talented designers using the day lily stitch. 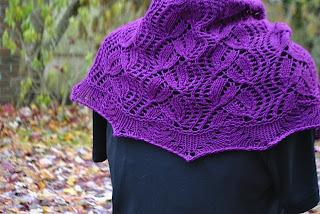 Here is Day Lily Shawl from Judy Marples. 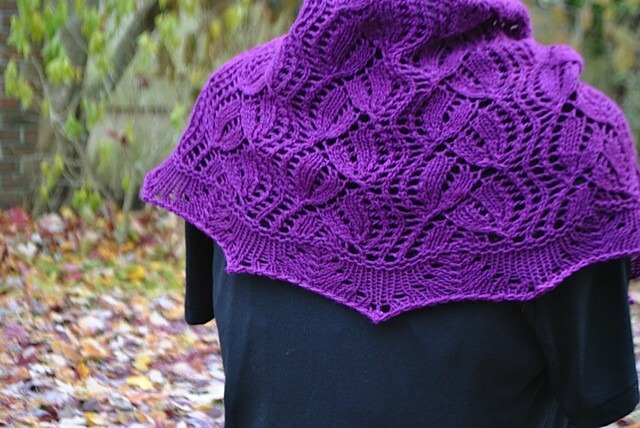 Both patterns use the day lily stitch differently. Judy's shawl begins at the top so the stitch is reversed and Laura's begins at the bottom, so the lilies seems to hang down or cascade. 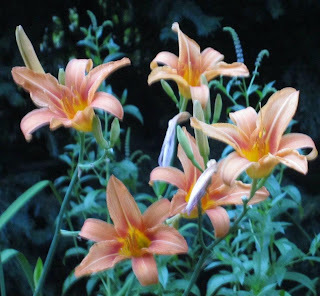 And here are my day lilies at dusk just before the end of their day. Actually the more I look at the two patterns above, the more I think that there may be two different stitches here or the designers have varied them. It doesn't matter. I just love the fact that nature can be translated into so many different mediums (media). My day lily story is that I occasionally have people ask me when day lilies bloom. Well, depending on the colour, they bloom at different times through out the spring and summer. I always used to tell people that the orange lilies, which seem to be the most common, bloomed on July 12th - Orangeman's Day or the commemoration of the Battle of the Boyne in Northern Ireland. Not everyone understood; but another friend of mine remembers being told that same story, when she was given a clump of orange liles. She said that she totally "freaked out" when the first flower opened on July 12. Sad to say that global warming has shifted our folk stories or maybe the "troubles' in Ireland are finally over, because this year my orange liles bloomed on June 12....now I wonder what day that is?